Wholehearted living is about engaging in our lives from a place of worthiness. It means cultivating the courage, compassion, and connection to wake up in the morning and think, No matter what gets done and how much is left undone, I am enough. It's going to bed at night thinking, Yes, I am imperfect and vulnerable and sometimes afraid but that doesn't change the truth that I am worthy of love and belonging. Seriously, I sat there staring at that paragraph for a full ten minutes as I let it sink in. How did the author know? How did she know that I equate my full plate--how much I get done in a day--to my self worth? How did she know how afraid I am to show my weaknesses (especially the weaknesses I haven't fully embraced yet)? How did she know that I often don't feel loved? Or that I don't feel like I really belong anywhere? How did she know? And it dawned on me that maybe we all feel like this to an extent. And yet, I watch others and I am sure, absolutely sure, that they know something about living that I don't. And maybe they do...maybe they've figured out the secret that it's okay to be imperfect. But maybe they haven't. The Gifts of Imperfection: Let Go of Who You Think You're Supposed to Be and Embrace Who You Are by Brene Brown is a book we all need to read. I admit, that whole thing about Who I Am vs. Who I Am Supposed to Be gets me every time. I think it's a fine line between embracing things I shouldn't embrace and being okay with where I am right now. I think that I should strive to be better, and maybe Who I Am is not good enough. So, I admittedly bristled a bit at the subtitle there. But then, like I said, I read that first paragraph, and I realized it wasn't like that at all. This is learning to let go of the unnecessary shame we carry around that says we don't measure up. It doesn't mean we can't strive to become better. In fact, I think if we can let go of the shame by embracing our imperfections, we will actually become better faster. We will become more courageous. More compassionate. More connected. 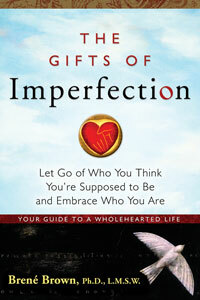 The book is divided into 10 "guideposts" that can help us let go of unhealthy traits and embrace new, healthier ones. I particularly need to re-read Guidepost #7 "Cultivating Play and Rest: Letting Go of Exhaustion as a Status Symbol and Productivity as Self-Worth" and Guidepost #9 "Cultivating Meaningful Work: Letting Go of Self-Doubt and 'Supposed To'" because sitting in my inbox right now are three e-mails that I really need to reply to. And the reply needs to be "No." But you have absolutely no idea how much anxiety even the thought of telling somebody I can't do something gives me. It's absolutely ridiculous! I had more insights into myself while reading this book than I have had in a really long time. Shameful really. But I will own my weaknesses. You'll see. I have one copy of this book for one of you (US/Canada only). Believe me, this is a book you shouldn't miss out on (have I said that enough yet? ), so enter this giveaway. Tell me how the quest for perfection plays a role in your life. I will draw for a winner on Thursday, October 14. And don't forget to check out Brene Brown's blog. Especially this post: The Perfect Protest. I would LOVE to win this book! My personal quest is about to take on a whole new realm as a single mother raising three daughters in an often scary world. I too need to focus on the fundamentals and not place my worth in how much I 'accomplish' but in my time spent with my children playing, loving and teaching them the fundamentals necessary. I certainly get the concept of Elder Uchtdorf's talk and I love it, but putting it in practice could take some time. Sounds like the perfect book for me. I happen to miss President Uchtdorf's talk. I need to read it very soon. Reading the first paragraph brought tears to my eyes. Enough said. For most of my life, I have felt that everyone else knows the "secret". I never feel good enough. Your post today really touched my heart. The words you wrote sounded like what's inside my head. Maybe all mothers feel this way? It doesn't seem like it. Why do we feel so alone when we're all so much alike? Pres. Uchtdorf's talk was so meaningful and personal to me, I was glad to be in my own home listening because I was so overcome with emotion. Thank you, Lara, for helping me feel connected today. Sis. Beck told us in Stake Conference, "Sisters, YOU are doing better than you think!". She said this multiple times. I think this applies here. I love you dear daughter. Time to use the Vitamin "N". I am a major people pleaser, and that's why I say yes way too much. I had a counselor tell me once that I should try and make one person mad every day. That should be my goal. When I do it, I am always amazed at the freedom I feel to be true to myself -- and that most often what I think will make someone mad doesn't. I really worry about what other people think, so I'm often trying to live up to what I think everyone else's expectations are for me (when in reality, most people probably don't care one way or the other what I'm doing). So, I do have a quest for perfection. I think it drives me for the better at times, but sometimes I'm definitely not focused on what is really important. Someone I love very much is battling this very issue right now. I too have fought this fight--and still do some times. During the height of my battle I learned that depression is the difference between who you are and who you think you should be. SHOULD--awful word sometimes. This book seems to be exactly what is needed--for me and for her. I will definitely read it either way. Thanks so much making me aware of it. I have to agree with Andrea on this one. I have always and will most likely always be a people pleaser. I usually feel I don't measure up and am alway striving for what I think people want me to be. Changing this personal perception has proven to be very hard. . I think that I as I am trying to figure out what to do to homeschool my kids. I think of being that perfect homeschool family that has activities, all the schooling that their little brains can soak up, and be a perfect mom. I am feeling very discouraged right now and wondering if I could even homeschool, can I give them what they need? Can I be the mom that they need? Why would Heavenly Father want me to do this? I just don't feel like I could be good enough at it. Anyways it sounds like a great book that I could indulge in. Well, I think you nailed it when you said that "..it dawned on me that maybe we all feel like this.."
Thank you so much for the great review. I'm really glad this one resonated with you! Thanks for being on the tour. The illusion of perfection has led to some pretty self-destructive habits in my life. It's a challenge I deal with every single day. The book sounds intriguing. Will there be something in there that will be just the right thing to help re-circuit all the weird control/perfection buttons in my head? I am always trying to balance military life with my hone life. Trying to be room parent and attend every field trip. Its exhausting! I have abandoned any quest for perfection and have decided to be happy with who I am. That is not to say that I am not constantly working to improve myself still, it is just that I don't beat myself up over not being perfect or accomplishing everything I want to in a day anymore. Sometimes I get a bit stressed out when I have a lot going on or a deadlines to meet, but I am learning to prioritize better and I am generally happy with life. The quest for perfection? It's a joke. A big, fat joke. Sigh. I'm worn down right now too. This book would probably be helpful to me. I think that, if I don't win, I'll find this book. So much of what you wrote in your review struck a chord with me. I can't even elaborate at the moment; it's too tough. Needless to say, I'm weary. I'd love to be done trying to be perfect, at least for this life. Sounds totally and completely up my alley! I think every single night I go to sleep thinking I didn't do enough. It really starts to wear on you after awhile and makes it harder to improve. Thanks for this recommendation! That paragraph hit me pretty strong just now. I need to be able to tell myself that. I need to be happy with me--no matter how much I don't get done as fast as I'd like. *hugs* Hope you're feeling a bit better by now. I remember what a life changer it was for me when I adjusted from thinking "Look at all the cleaning (playing with the kids/reading/crafting) I didn't get to today." to "I had one hour to spend cleaning (etc) and I really did well with that one hour" or "I wasted a lot of that hour and could do better next time." Regardless of if I "finished" or not. Ironic--I've just finished several weeks of therapy over this same issue!! And my "graduating" therapy was when I said "I actually BELIEVE that my value doesn't change, based on what I do"....I'm still who I am--a daughter of God--no matter what I do, or no matter what I DON'T do. First, Pick me! Pick me!! I love thinking about these things. I do. OK, now on to your question. Hmmmmm... What a great thing to ponder. What role does perfection play in your life? Well, my guiding quote at work is by Ansel Adams. He says, "I strive for perfection and settle for excellence." Yes! My heart screams yes - strive for perfection, settle for nothing less than excellence. In my personal life, it's a bit different. There, it's all about relationships and who defines perfection anyway? In my personal life, it's about love. Every minute, every day. All about love and connection. Love, love, love. Which, I guess, is really a perfection of it's own. Isn't it? I love this! Perfection has made me miss out on a lot of opportunities...Bye bye Miss Perfect...Hello Miss Possibility!! I have been working on letting go of the things I should me doing/thinking/saying/feeling and embracing the things I am able to do/think/say/feel and really looking at the reasons behind why I do/think/say/feel these things...this book would be a perfect side dish to the message I'm trying to learn! #7 "Cultivating Play and Rest: Letting Go of Exhaustion as a Status Symbol and Productivity as Self-Worth"
I am dying to read this chapter because exhaustion and productivity are what I feel is part of the cultural expectation at home, in church and in the workplace. That if you are not totally wiped out, then obviously you are not doing enough. So wrong! Pick Me! Ummm, every day I beat myself up because I didn't get enough done. My house is never perfect. My hair isn't. My kids certainly aren't. I was thinking about this today though...really why does it matter? To present myself to the world as something perfect? Because then I would just be the hated perfect one...ha ha! Anyway, the quest holds me back I think. I spend a lot of energy on it when I could spend energy on actually getting things accomplished!